My friend Krystal and I made a visit to the Guggenheim during the Friday of Labor Day Weekend to check out its relatively new museum restaurant (opening back in February), The Wright. 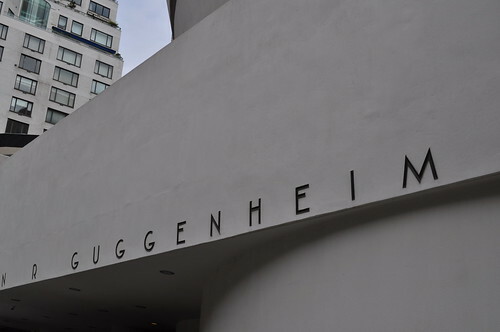 Here's the "Solomon R. Guggenheim" museum name written in Frank Lloyd Wright's own "signature" typeset! 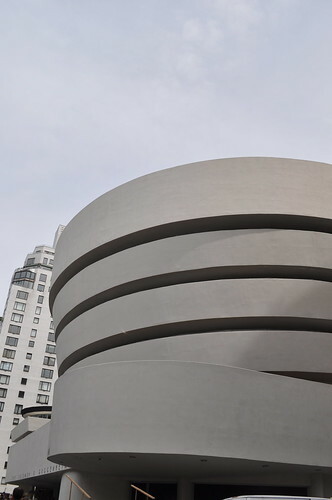 Opening in 1959, as Frank Lloyd Wright's last major work, here is the Guggenheim's (in)famous "inverted ziggurat" or "upside-down cupcake"! Entrance to The Wright museum restaurant! 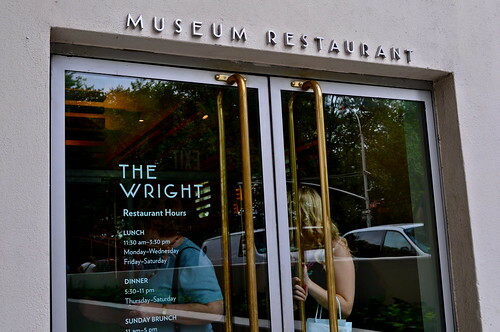 I like how they used FLW's last name as the restaurant's name (very clever) as well as his signature typeset as the restaurant's logo--paying homage to and keeping it true to the museum's beloved architect! Inside The Wright. 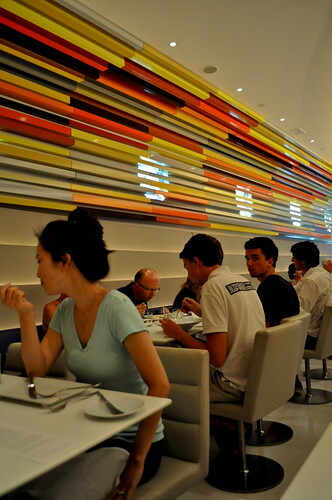 The multi-colored yellow, grey, orange, and brown commissioned installation art was created by Liam Gillick, a British artist, entitled The horizon produced by a factory once it has stopped producing views. This installation "traces the distrinct architectural space of The Wright", as noted in the description blurb for it, as its "parrallel beams meant to be understoods as a 'series of horizons'". These parallel aluminum pieces are placed in such a way that is reminiscent of FLW's prairie-style architecture, and it definitely works very well with the space. The Wright's bar area. 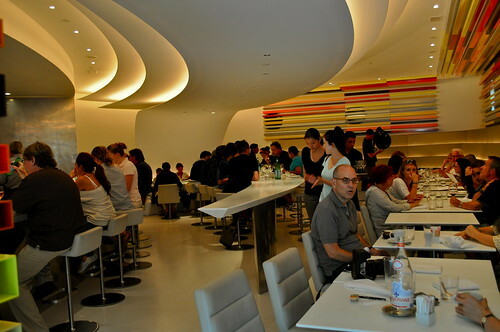 As you can see the curved design of the ceiling (detail photo below) is indubitably influenced by the Guggenheim's inverted ziggurat, making this restaurant a very close extension of FLW's design of the museum. The table is placed aptly below the curved ceiling, paralleling its motion very fluidly. I'm loving the interior design of this place so much! 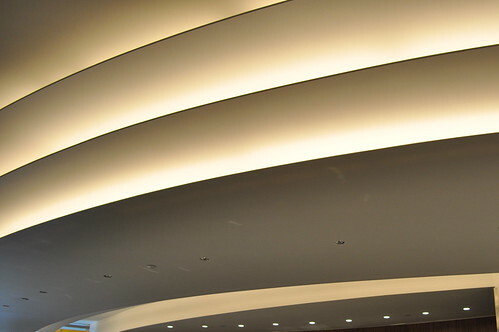 Detail view of curved ceiling structure. They offered wine cocktails called Then and Now (clever!). 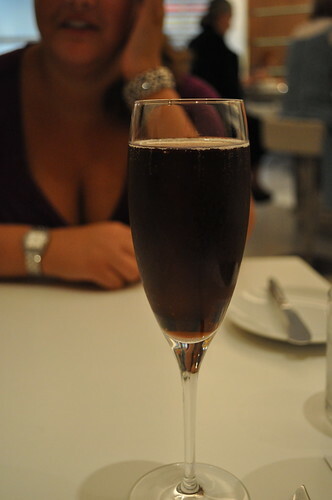 As I've mentioned, I'm a huge fan of black currant liquer (i.e., crème de cassis) with champagne, as well as amaretto (I also like amaretto sours), I thought Then would be a great choice, combining the two essences from my favorite cocktails. Boy, was I wrong. 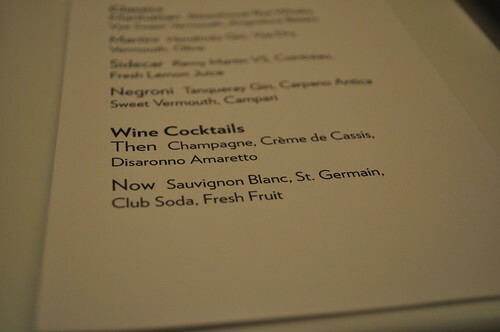 Then cocktail with champagne, crème de cassis, and Disaronno amaretto (see menu above). If you hated cough syrup as a kid, especially grape-flavored ones, DO NOT ORDER THIS COCKTAIL. The black currant flavor was very strong and bitter, and somehow, the amaretto exacerbated this flavor in the most horrible way possible. I immediately flashed back to the times when I had those horrible childhood coughs and all the feelings of being ill associated with it. Not good. Maybe it's the reason why they call it Then. I really wish I had ordered the Now instead. 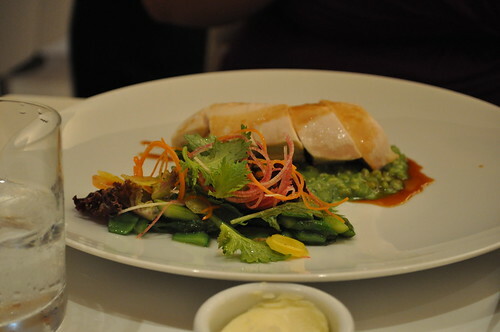 Krystal ordered the organic chicken breast with spinach barley, green and white asparagus, and natural jus. She reported to me that it was "delish--moist and very tasty". Even though tasty is probably my least favorite adjective when it comes to describing food (I can't help it--the word's sound just makes me cringe for whatever reason), I'll take her word for it, that it was very full of taste :] it certainly looks like it was! I wish I had stolen a tiny bite! I had the roasted suckling pig with caramelized quince (a fruit related to pears and apples), quince puree, and a mustard espresso emulsion. The pig was prepared very nicely--the meat was very tender and pieced off very easily. The emulsion and puree were both kind of potent andconcentrated for my liking. The taste combination was good, but somehow it overpowered the succulent texture of the pig. Perhaps if they lightened on the amount of the mixture or made it less concentrated, it would've been even better. The quince gave the dish a very tart taste that surprised me, in a good way, that made the emulsion easier to eat with the pig. View of The Wright from the entrance. 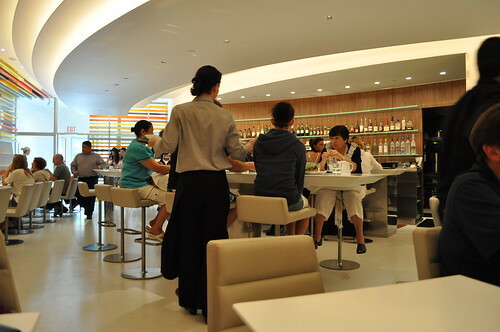 Findings: Though the food was very good, I actually enjoyed the ambience and restaurant design the most. 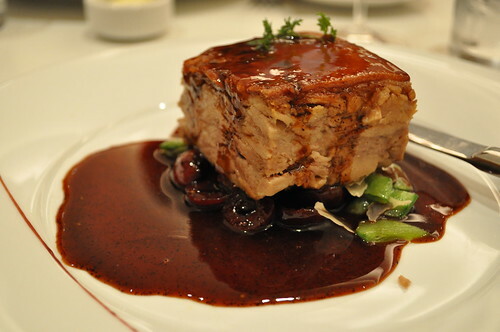 I wouldn't mind going back for the prix-fixe lunch menu (starting at $24 for two courses). It is definitely a reliable place to go to after a visit to the Guggenheim--whether for drinks (just don't order Then--make sure to ask for a recommendation if you're not sure about alternatives!) or a meal. The restaurant designers definitely stayed true to FLW's architectural forms that makes the Guggenheim so unique and noteworthy, yet added their own additional contemporary influences (i.e., Liam Gillick's installation art, very modern furniture) to bring the past (then) to the present (now)--like the drinks offered on the menu! Price point: $12 for Then cocktail; $24-28 each main course.